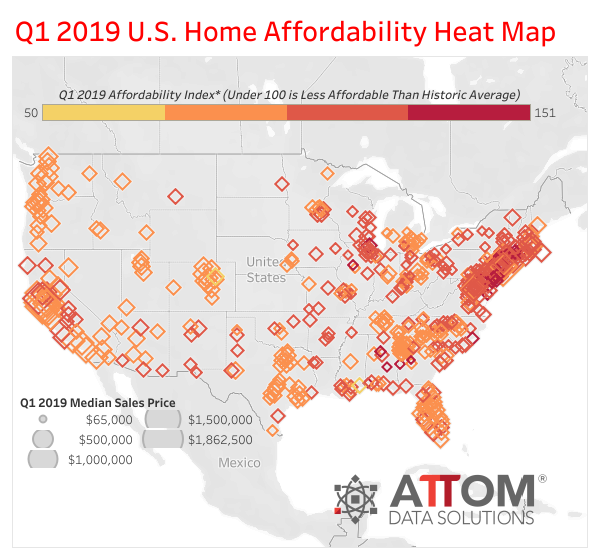 According to a report from ATTOM Data Solutions, median home prices in the first quarter of 2019 were not affordable for average wage earners in 335 of 473 U.S. counties analyzed in the report (71 percent). The report determined affordability for average wage earners by calculating the amount of income needed to make monthly house payments — including mortgage, property taxes and insurance — on a median-priced home, assuming a 3 percent down payment and a 28 percent maximum “front-end” debt-to-income ratio. That required income was then compared to annualized average weekly wage data from the Bureau of Labor Statistics. The 335 counties where a median-priced home in the first quarter was not affordable for average wage earners included Los Angeles County, California; Maricopa County (Phoenix), Arizona; San Diego County, California; Orange County, California; and Miami-Dade County, Florida.The 138 counties (29 percent of the 473 counties analyzed in the report) where a median-priced home in the first quarter was still affordable for average wage earners included Cook County (Chicago), Illinois; Harris County (Houston), Texas; Wayne County (Detroit), Michigan; Philadelphia County, Pennsylvania; and Cuyahoga County (Cleveland), Ohio. “We are seeing a housing market in flux across the United States, with a mix of tailwinds and headwinds that are pricing many people out of the housing market, but also are creating potentially better conditions for buyers,” said Todd Teta, chief product officer with ATTOM Data Solutions. “Continually rising home prices in many areas do remain a financial stretch – or simply unaffordable – for a majority of households. ATTOM Data Solutions released its Year-End 2018 U.S. Home Sales Report, which shows that home sellers in 2018 realized an average home price gain since purchase of $61,000, up from $50,000 last year and up from $39,500 two years ago in 2016 to the highest level since 2006 — a 12-year high. That $61,000 average home seller profit represented an average 32.6 percent return on investment compared to the original purchase price, up from 27.0 percent last year and up from 21.9 percent in 2016 to the highest average home seller ROI since 2006. Among 217 metropolitan statistical areas with a population greater than 200,000 and sufficient historical data, the highest returns on investment were almost exclusively in western states, with concentrations along areas of the west coast. Those with the highest average home seller ROI were San Jose, California (108.8 percent); San Francisco, California (78.6 percent); Seattle, Washington (70.7 percent); Merced, California (66.4 percent); and Santa Rosa, California (66.1 percent). The U.S. median home price in 2018 was $248,000, up 5.5 percent from 2017 to a new all-time high. Annual home price appreciation in 2018 slowed slightly compared to the 7.1 percent in 2017. 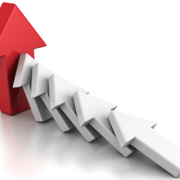 Among 127 metropolitan statistical areas with a population of 200,000 or more and sufficient home price data, those with the biggest year-over-year increase in home prices were Mobile, Alabama (up 21 percent); Flint, Michigan (up 19 percent); San Jose, California (up 18.9 percent); Atlantic City, New Jersey (up 16.4 percent) and Las Vegas, Nevada (up 13.5 percent). Along with San Jose and Las Vegas, other major metro areas with a population of at least 1 million with a double-digit percentage increase in home prices in 2018 were Grand Rapids, Michigan (up 10.6 percent); San Francisco, California (up 10.3 percent); Columbus, Ohio (up 10.1 percent); and Atlanta, Georgia (up 10.1 percent). 88 of the 127 metros (69 percent) reached new record home price peaks in 2018, including Los Angeles, Dallas-Fort Worth, Houston, Atlanta, and Boston. Homeowners who sold in the fourth quarter of 2018 had owned their homes an average of 8.30 years, up from 8.13 years in the previous quarter and up from 7.95 years in Q4 2017 to the longest average home seller tenure as far back as data is available, Q1 2000. Counter to the national trend, 16 of the 108 metro areas analyzed in the report posted a year-over-year decrease in average home seller tenure including: Vallejo-Fairfield, California (down 5 percent); Reno, Nevada (down 3 percent); Redding, California (down 2 percent); Panama City, Florida (down 2 percent); Chattanooga, Tennessee (down 2 percent); Eugene, Oregon (down 2 percent); Crestview-Fort Walton Beach, Florida (down 1 percent); Tucson, Arizona (down 1 percent), Punta Gorda, Florida (down less than 1 percent); Manchester-Nashua, New Hampshire (down less than 1 percent); and Truckee, California (down less than 1 percent). Nationwide all-cash purchases accounted for 27.8 percent of single-family home and condo sales in 2018, unchanged from 2017 but down from its peak in 2011 at 38.4 percent. However, this is still well above the pre-recession average of 18.7 percent between 2000 and 2007. 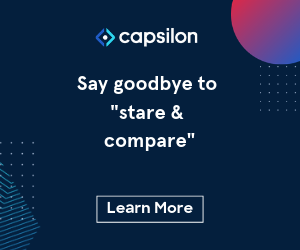 Among 200 metropolitan statistical areas with a population of at least 200,000 and sufficient cash sales data, those with the highest share of all-cash purchases in 2018 were Montgomery, Alabama (53.6 percent); Naples, Florida (52.5 percent); Macon, Georgia (50.8 percent); Cape Coral-Fort Myers, Florida (45.4 percent); and North Port-Sarasota, Florida (45.4 percent). Distressed home sales — including bank-owned (REO) sales, third-party foreclosure auction sales, and short sales — accounted for 12.4 percent of all U.S. single family home and condo sales in 2018, down from 14.0 percent in 2017 and down from a peak of 38.6 percent in 2011. Counter to the national trend, the share of distressed sales increased in 2018 in Kansas (up 13 percent); Louisiana (up 13 percent); Wisconsin (up 2 percent); Kentucky (up 2 percent); Maine (up 1 percent); Colorado (up 1 percent); Indiana (up 1 percent); and West Virginia (up 1 percent). Among 209 metropolitan statistical areas with a population of at least 200,000 those with the highest share of distressed sales in 2018 were Atlantic City, New Jersey (37.2 percent); Montgomery, Alabama (25.2 percent); Trenton, New Jersey (23.8 percent); Youngstown, Ohio (23.6 percent); and Rockford, Illinois (22.1 percent). Among 53 metropolitan statistical areas with a population of at least 1 million, those with the highest share of distressed sales in 2018 were Philadelphia, Pennsylvania (20.7 percent); Baltimore, Maryland (19.9 percent); Cleveland, Ohio (19.4 percent); Memphis, Tennessee (19.1 percent); and Providence, Rhode Island (18.3 percent). 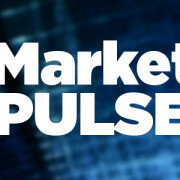 Institutional investors nationwide accounted for 2.7 percent of all single-family home and condo sales in 2018, down from 3.0 percent in 2017. Among 200 metropolitan statistical areas with a population of at least 200,000 and sufficient institutional investor sales data, those with the highest share of institutional investor sales in 2018 were Montgomery, Alabama (9.6 percent); Memphis, Tennessee (8.1 percent); Columbia, South Carolina (7.6 percent); Birmingham, Alabama (7.1 percent); Atlanta, Georgia (7.0 percent); and Charlotte, North Carolina (6.5 percent). Nationwide buyers using Federal Housing Administration (FHA) loans accounted for 10.6 percent of all single-family home and condo purchases in 2018, down from 13.6 percent in 2017 to the lowest level since 2007. Among 200 metropolitan statistical areas with a population of at least 200,000 and sufficient FHA buyer data, 6 out of the top 10 metro areas with the highest share of FHA sales were in Texas. Those with the highest share of FHA buyers in 2018 were McAllen, Texas (26.3 percent); El Paso, Texas (25.3 percent); Amarillo, Texas (23.0 percent); Beaumont-Port Arthur, Texas (22.7 percent); and Elkhart, Indiana (21.5 percent). 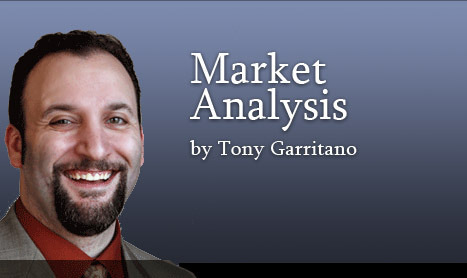 ATTOM Data Solutions released its Year-End 2018 U.S. Foreclosure Market Report, which shows foreclosure filings — default notices, scheduled auctions and bank repossessions — were reported on 624,753 U.S. properties in 2018, down 8 percent from 2017 and down 78 percent from a peak of nearly 2.9 million in 2010 to the lowest level since 2005. Those 624,753 properties with foreclosure filings in 2018 represented 0.47 percent of all U.S. housing units, down from 0.51 percent in 2017 and down from a peak of 2.23 percent in 2010 to the lowest level since 2005. 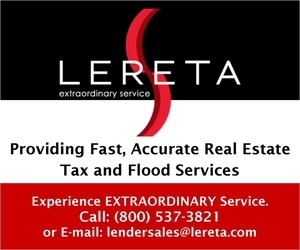 ATTOM’s year-end foreclosure report provides a unique count of properties with a foreclosure filing during the year based on publicly recorded and published foreclosure filings collected in more than 2,500 counties nationwide, with address-level data on more than 23 million foreclosure filings historically also available for license or customized reporting. See full methodology below. The report also includes new data for December 2018, when there were 52,069 U.S. properties with foreclosure filings, down 2 percent from the previous month and down 19 percent from a year ago — the 6th consecutive month with a year-over-year decrease in foreclosure activity. “Plummeting foreclosure completions combined with consistently falling foreclosure timelines in 2018 provide evidence that most of the distress from the last housing crisis has now been cleaned up,” said Todd Teta, Chief Product Officer. “But there was also some evidence of distress gradually returning to the housing market in 2018, with foreclosure starts increasing from the previous year in more than one-third of all state and local housing markets. ATTOM Data Solutions released its Q3 2018 U.S. Foreclosure Market Report, which shows a total of 177,146 U.S. properties with foreclosure filings — default notices, scheduled auctions or bank repossessions — in the third quarter, down 6 percent from the previous quarter and down 8 percent from a year ago to the lowest level since Q4 2005 — a nearly 13-year low. U.S. foreclosure activity in Q3 2018 was 36 percent below the pre-recession average of 278,912 properties with foreclosure filings per quarter between Q1 2006 and Q3 2007 — the eighth consecutive quarter where U.S. foreclosure activity has registered below the pre-recession average. 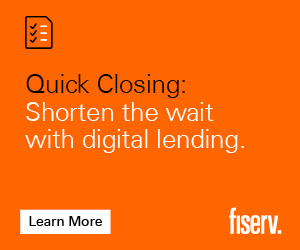 Lenders started the foreclosure process on 91,849 U.S. properties in Q3 2018, down 6 percent from the previous quarter and down 3 percent from a year ago — the 13thconsecutive quarter with a year-over-year decrease in foreclosure starts. Counter to the national trend, 15 states posted year-over-year increases in foreclosure starts in Q3 2018, including Florida (up 25 percent); Texas (up 3 percent); Maryland (up 13 percent); Michigan (up 32 percent); and Missouri (up 10 percent). Also counter to the national trend, 79 of 219 metropolitan statistical areas analyzed in the report (36 percent) posted a year-over-year increase in foreclosure starts in Q3 2018, including Los Angeles, California (up 2 percent); Houston, Texas (up 51 percent); Washington, D.C. (up 2 percent); Miami, Florida (up 29 percent); and Detroit, Michigan (up 65 percent). Other markets with at least 1 million people and a year-over-year increase of at least 15 percent in foreclosure starts in Q3 2018 were Minneapolis-St. Paul, Minnesota; Tampa-St. Petersburg, Florida; St. Louis, Missouri; Orlando, Florida; Las Vegas, Nevada; Austin, Texas, Milwaukee, Wisconsin; Jacksonville, Florida; and Grand Rapids, Wyoming. ATTOM Data Solutions released its Q3 2018 U.S. Residential Property Mortgage Origination Report, which shows that 681,455 refinance mortgages secured by residential property (1 to 4 units) were originated in the third quarter, down 15 percent from the previous quarter and down 21 percent from a year ago to the lowest level as far back as data is available — Q1 2000. The refinance mortgages originated in Q3 2018 represented an estimated $175.1 billion in total dollar volume, down 14 percent from the previous quarter and down 21 percent from a year ago to the lowest level since Q1 2014 — a 4.5-year low. Residential refinance mortgage originations decreased from a year ago in 197 of the 225 metropolitan statistical areas analyzed in the report (88 percent), including Los Angeles (down 31 percent); New York (down 11 percent); Dallas-Fort Worth (down 5 percent); Phoenix (down 14 percent); and Atlanta (down 33 percent). Counter to the national trend, residential refinance mortgage originations increased from a year ago in 28 of the 225 metro areas analyzed in the report (12 percent), including Houston (up 69 percent); Miami (up 29 percent); Tampa-St. Petersburg (up 33 percent); San Antonio (up 3 percent); and Orlando (up 30 percent). 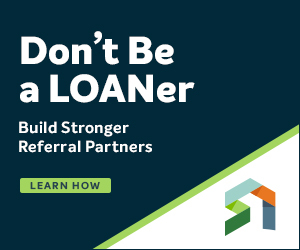 Lenders originated 892,760 residential purchase mortgages in Q3 2018, down 5 percent from the previous quarter and down 2 percent from a year ago. 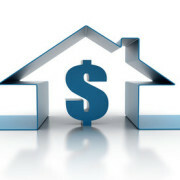 Residential purchase mortgage originations decreased from a year ago in 121 of the 225 metropolitan statistical areas analyzed in the report (54 percent), including New York (down 6 percent); Dallas-Fort Worth (down 5 percent); Chicago (down 14 percent); Phoenix (down 2 percent); and Los Angeles (down 14 percent). 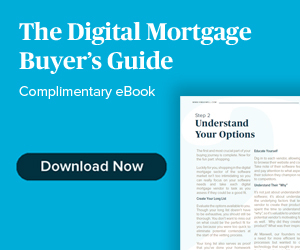 Counter to the national trend, residential purchase mortgage originations increased from a year ago in 104 of the 225 metro areas analyzed in the report (46 percent), including Atlanta (up 12 percent); Houston (up 3 percent); Miami (up 2 percent); Tampa-St. Petersburg (up 3 percent); and Nashville (up 1 percent). 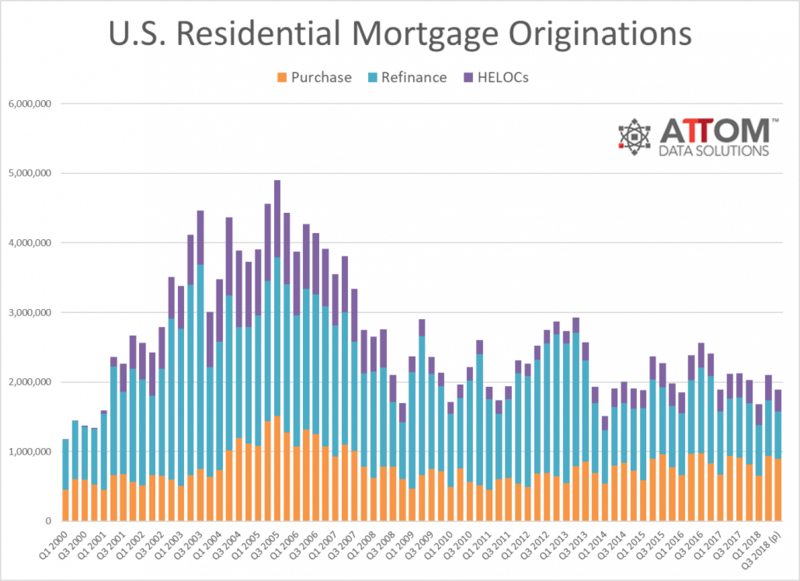 A total of 313,744 Home Equity Lines of Credit (HELOCs) were originated on residential properties in Q3 2018, down 14 percent from the previous quarter and down 11 percent from a year ago. Residential HELOC mortgage originations decreased from a year ago in 150 of the 225 metropolitan statistical areas analyzed in the report (67 percent), including New York (down 14 percent); Los Angeles (down 18 percent); Seattle (down 3 percent); Chicago (down 27 percent); and Philadelphia (down 16 percent). Counter to the national trend, residential HELOC mortgage originations increased from a year ago in 73 of the 225 metro areas analyzed in the report (32 percent), including Miami (up 4 percent); Tampa-St. Petersburg (up 22 percent); Kansas City (up 20 percent); Orlando (up 3 percent); and Omaha (up 11 percent). The median down payment on single family homes and condos purchased with financing in Q3 2018 was $20,250, up 7 percent from the previous quarter and up 16 percent from a year ago to a record high as far back as data is available, Q1 2000. The median down payment as a percentage of the median home sales price in Q3 2018 was 7.6 percent, up from 7.2 percent in the previous quarter and up from 6.8 percent in Q3 2017 to the highest since Q4 2003 — a nearly 15-year high. Among 96 metropolitan statistical areas analyzed in the report for down payments, those with the highest median down payment as a percentage of median home sales price in Q3 2018 were San Jose, California (24.7 percent); San Francisco, California (23.3 percent); Los Angeles, California (20.6 percent); Oxnard-Thousand Oaks-Ventura, California (19.0 percent); and Fort Collins, Colorado (18.6 percent). Residential loans backed by the Federal Housing Administration (FHA) accounted for 10.5 percent of all residential property loans originated in Q3 2018, up from a more than 10-year low of 10.2 percent in the previous quarter but still down from 12.5 percent a year ago. Residential loans backed by the U.S. Department of Veterans Affairs (VA) accounted for 5.5 percent of all residential property loans originated in Q3 2018, up from 5.4 percent in the previous quarter but still down from 6.6 percent a year ago. 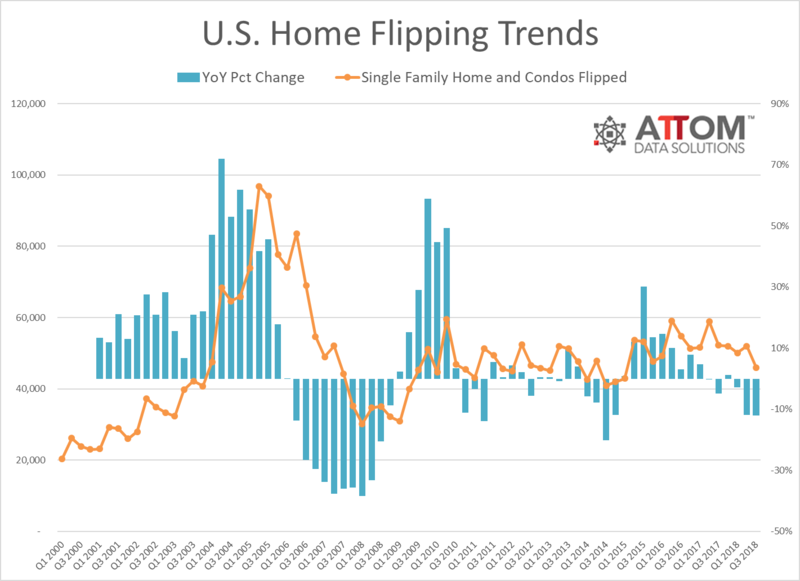 According to data from ATTOM Data Solutions, its Q3 2018 U.S. Home Flipping Report shows that a total of 45,901 U.S. single family homes and condos were flipped in the third quarter of 2018, down 12 percent from a year ago to the lowest level since Q1 2015 — a 3.5-year low. Homes flipped in Q3 2018 represented 5.0 percent of all single family home and condo sales during the quarter — down from a 5.2 percent home flipping rate in Q2 2018 and down from a 5.1 percent home flipping rate in Q3 2017 to the lowest level since Q3 2016. Homes flipped in Q3 2018 sold for an average of $63,000 more than what the home flipper purchased them for, down from an all-time high average gross flipping profit of $68,000 in the first quarter and down from an average gross flipping profit of $65,000 a year ago to the lowest level since Q2 2016. 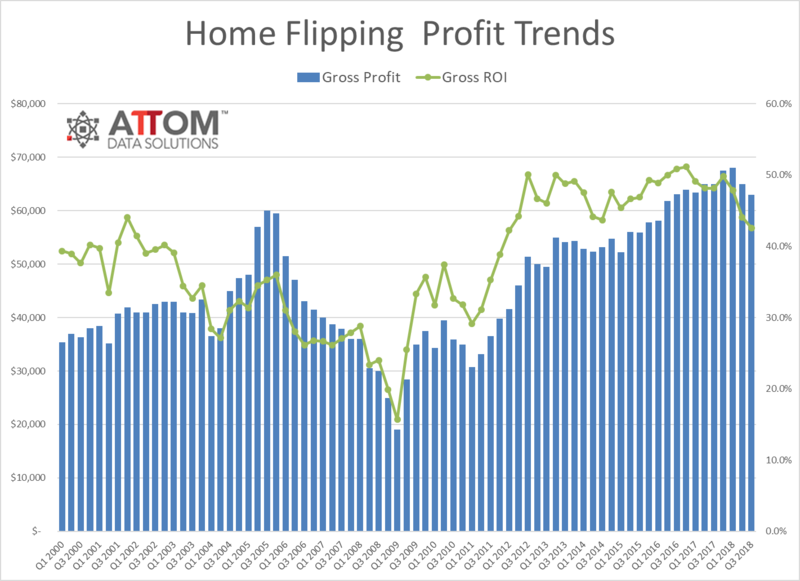 The average gross flipping profit of $63,000 in Q3 2018 represented an average 42.6 percent gross flipping return on investment, down from an average 44.1 percent gross flipping ROI in the previous quarter and down from an average 48.1 percent gross flipping ROI in Q3 2017 to the lowest level since Q1 2012 — a 6.5-year low. The share of homes flipped that were sold by the home flipper between $100,000 to $200,000 made up 31.6 percent of all flipped sales, while those flip sales that occurred on homes sold for more than $5 million saw the highest gross flipping return on investment (ROI) of any price range. ATTOM Data Solutions released its Q3 2018 U.S. Home Equity & Underwater Report, which shows that in the third quarter of 2018, nearly 14.5 million U.S. properties were equity rich — where the combined estimated amount of loans secured by the property was 50 percent or less of the property’s estimated market value — up by more than 433,000 from a year ago to a new high as far back as data is available, Q4 2013. 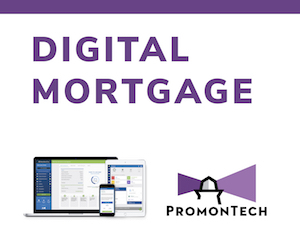 The 14.5 million equity rich properties in Q3 2018 represented 25.7 percent of all properties with a mortgage, up from 24.9 percent in the previous quarter but down from 26.4 percent in Q3 2017. The report also shows more than 4.9 million U.S. properties were seriously underwater — where the combined estimated balance of loans secured by the property was at least 25 percent higher than the property’s estimated market value, representing 8.8 percent of all U.S. properties with a mortgage. That 8.8 percent share of seriously underwater homes was down from 9.3 percent in the previous quarter but still up from 8.7 percent in Q3 2017. >>Sizing and choosing the correct VM for the Azure environment. 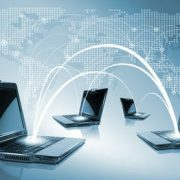 Post migration, ATTOM Chief Technology Officer Todd Teta estimates the company is now saving 30% of their budget on infrastructure. ATTOM’s Chief Data Officer Richard Sawicky commented, “We now have the flexibility to scale, expand, and consolidate all of our operations and be nimble as we take on new projects, new datasets, and better serve our customers on a modern platform capable of enrolling a lot of the Azure functionality. 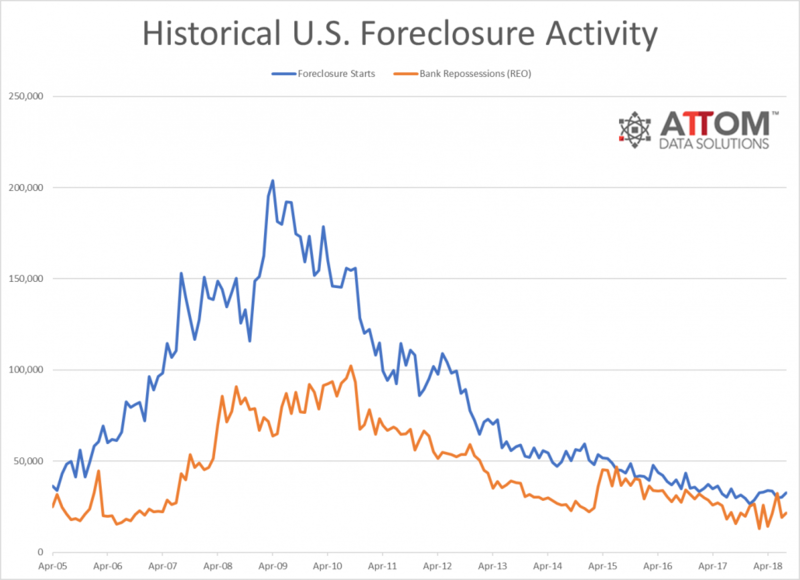 According to data from ATTOM Data Solutions, there were 70,166 U.S. properties with foreclosure filings in August 2018, up 9 percent from July but still down 7 percent from a year ago. Nationally one in every 1,910 U.S. properties had a foreclosure filing in August 2018, according to the report. States with the highest foreclosure rates in August were New Jersey (one in every 690 housing units); Maryland (one in every 918 housing units); Nevada (one in every 984 housing units); Delaware (one in every 1,012 housing units); and Florida (one in every 1,229 housing units). Among 291 metropolitan statistical areas with at least 200,000 people, those with the highest foreclosure rates in August were Atlantic City, New Jersey (one in every 354 housing units); Fayetteville, North Carolina (one in every 444 housing units); Trenton, New Jersey (one in every 546 housing units); Columbia, South Carolina (one in every 807 housing units); and Bakersfield, California (one in every 864 housing units). Among 53 metro areas with at least 1 million people, those with the highest foreclosure rates in August were Baltimore, Maryland (one in every 871 housing units); Philadelphia, Pennsylvania (one in every 887 housing units); Las Vegas, Nevada (one in every 891 housing units); Jacksonville, Florida (one in every 982 housing units); and Cleveland, Ohio (one in every 1,012 housing units). ATTOM Data Solutions released its 2018 U.S. Natural Hazard Housing Risk Index, which found that median home prices in cities with the top 80th percentile for natural hazard housing risk have appreciated 40 percent on average over the last 10 years — 1.7 times the 24 percent home price appreciation in the overall U.S. housing market during the same time period. For the report ATTOM indexed natural hazard risk in more than 3,000 counties and more than 22,000 U.S. cities based on the risk of six natural disasters: earthquakes, floods, hail, hurricane storm surge, tornadoes, and wildfires. ATTOM also analyzed housing trends in 2,616 cities and 440 counties — containing more than 53 million single family homes and condos — broken into five equal quintiles of natural hazard housing risk. Foreclosure rates were lower in cities in the top 80th percentile for natural hazard housing risk, and this was true for all individual natural hazard risk types except for flood risk. In cities in the top 80th percentile for flood risk, active foreclosures represented 0.61 percent of all properties, well above the foreclosure rate of 0.38 percent across all risk categories. Cities with the highest flood risk also posted seriously underwater rates (loan-to-value ratio of 125 percent or higher) above the overall market average — 8.9 percent of all homes with a mortgage compared to 8.5 percent nationwide. Tornado risk was the only other individual natural hazard risk factor with seriously underwater rates above the market average in the highest risk cities — 10.0 percent of all homes with a mortgage. The report also shows that homebuyers so far in 2018 paid an average 1.0 percent premium above estimated market value for homes in cities with the highest natural disaster risk while homes in cities with the lowest natural disaster risk sold at an average 3.7 percent discount below estimated market value. The exception to this trend was in cities with the highest flood risk, where homes sold at an average 2.4 percent discount below estimated market value, cities with the highest tornado risk (2.2 percent discount below estimated market value), and cities with the highest hurricane storm surge risk (1.4 percent discount below estimated market value). Among the 2,616 cities analyzed in the report with sufficient housing trend data, those with the top 20 highest natural hazard housing risk indexes were all located in the following metropolitan statistical areas: Oklahoma City, Oklahoma; San Diego, California; Clearlake, California; San Jose, California; Madera, California; Riverside-San Bernardino, California, Bakersfield, California; Houston, Texas, Santa Cruz, California; and Huntsville, Alabama. Among the 440 counties analyzed in the report with sufficient housing trend data, those with the highest natural hazard housing risk indexes were Oklahoma County, Oklahoma (Oklahoma City); Monroe County, Florida (Key West); Santa Cruz County, California (Santa Cruz); Santa Clara County, California (San Jose); and Marin County, California (San Francisco). Among those same 440 counties, those with the lowest natural hazard housing risk indexes were Milwaukee County, Wisconsin (Milwaukee); Muskegon County, Michigan (Muskegon); Cuyahoga County, Ohio (Cleveland); Kenosha County, Wisconsin (Chicago metro); and Monroe County, New York (Rochester). For its fifth annual Natural Hazard Housing Risk Index, ATTOM Data Solutions indexed more than 3,000 U.S. counties and more than 22,000 U.S. cities based on risk of six natural disasters: earthquakes, floods, hail, hurricane storm surge, tornadoes and wildfires. ATTOM also analyzed home sales and price trends in 440 counties and 2,616 cities with sufficient property data. A risk index was created for each of the six natural hazards in each city and count with natural hazard data available. Each natural hazard index was divided into five categories of risk: Very High, High, Moderate, Low and Very Low based on a severity scale. Those six natural hazard indexes were summed to create a Total Natural Hazard Index. 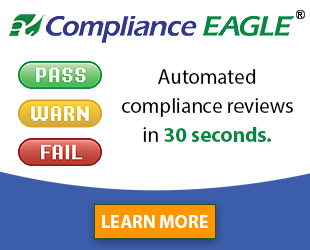 The maximum index for each category of risk is 60, and the maximum possible total index score is 360. For the home sales and price trends analysis, the indexes in 735 counties and 3,441 cities were split into five equal groups (quintiles) matching the aforementioned five categories of risk. Flood zone data is based on flood zones created by the Federal Emergency Management Agency (FEMA), and the level of risk was based on the percentage of homes in each county located in high-risk flood zones: A, A99, AE, AH, A.
Earthquake data is from the United States Geological Survey (USGS), and the level of risk was based on the probability of a magnitude 5.0 earthquake in each county. Tornado data is from the National Oceanic and Atmospheric Administration (NOAA), and level of risk was based on the Destruction Potential Index (DPI) for each county. DPI is calculated using number of tornados, path of tornados in square miles, and intensity of tornados on the Fujita scale (FO to F5). Wildfire data is from the United States Department of Agriculture Forest Service and Fire Modeling Institute, and risk level is based on the percentage of homes in each county located in “Very High” or “High” Wildfire Hazard Potential (WHP) areas. Hurricane storm surge data is from FEMA and the National Hurricane Center (NHC), and risk level is based on the percentage of homes located in flood zones identified as having a risk of “storm-induced waves”: V and VE. Hail data is from NOAA and the risk level is based on the average number of hail storms per year in each county with hail that exceeds 1-inch in size over the past 15 years.